John I (27 December 1350 – 19 May 1396), called by posterity the Hunter[a] or the Lover of Elegance,[b] but the Abandoned[c] in his lifetime, was the King of Aragon from 1388 until his death. John was the eldest son of Peter IV and his third wife, Eleanor, who was the daughter of Peter II of Sicily. He was born in Perpignan, capital of the Rousillon, which at that time was part of the Principality of Catalonia, in the Crown of Aragon. He was a man of character, with a taste for verse. He was a Francophile and married Violant of Bar against the wishes of his father, who had wanted him to marry a princess of Sicily. His last marriage was happy. His wife frequently participated in government, since the king was often ill.
Once on the throne, John abandoned his father's relatively Anglophile policy and made an alliance with France. He continued Aragon's support for the Pope of the Avignon line, Clement VII, in the Western Schism. John also made an alliance with Castile, and confirmed in 1388 a treaty with Navarre fixing borders between these kingdoms. In 1389-90, the Aragonese battled the troops of the Count of Armagnac, John III, who was attempting to conquer the lands of the vassal Kingdom of Majorca. The attack went from Empordà to Girona. The invaders were defeated in 1390 by Aragonese troops commanded by John's brother Martin. During 1388-90, John gradually lost all lands of the Duchies of Athens and Neopatras in Greece. In 1391, John promulgated legislation on Jews in different cities of the Kingdom of Aragon. Also in 1391, his administration faced a revolt in the vassal kingdom of Sicily, where the population had proclaimed Louis II of Naples as king. John was a protector of culture of Barcelona. He established in 1393 the Consistory of Barcelona (jocs florals), imitating the same office in Toulouse. Aragon had been attempting to subjugate Sardinia since the reign of James II, and gradually the Aragonese had conquered most of the island. However, in the 1380s, the remaining independent principality Arborea became a fortress of rebellion and the Aragonese were rapidly driven back by Eleanor de Bas-Serra. The Aragonese continued in John's reign to attempt to suppress rebels in Sardinia and regain lost territories. However, during John's reign, practically the whole of Sardinia was lost. John's reign was characterized by disastrous financial administration. Joanna (Daroca, October 1375 - Valencia, September 1407), who married on 4 June 1392 at Barcelona to Mathieu, Count of Foix. Together they claimed the throne of Aragon after her father's death. Matthew of Foix invaded Aragonese territories, but was driven back by the new King Martin. Joanna died soon after, childless. This article incorporates text from a publication now in the public domain: Chisholm, Hugh, ed. (1911). "John I of Aragon" . Encyclopædia Britannica. 15 (11th ed.). Cambridge University Press. p. 440. 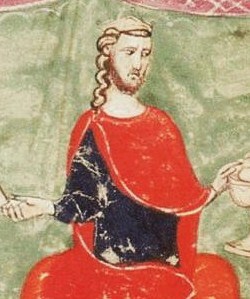 Peter IV, called the Ceremonious, was from 1336 until his death the King of Aragon and also King of Sardinia and Corsica, King of Valencia, and Count of Barcelona. In 1344, he deposed James III of Majorca and made himself King of Majorca. Martin the Humane, also called the Elder and the Ecclesiastic, was King of Aragon, Valencia, Sardinia and Corsica and Count of Barcelona from 1396 and King of Sicily from 1409. He failed to secure the accession of his illegitimate grandson, Frederic, Count of Luna, and with him the rule of the House of Barcelona came to an end. James II, called the Just, was the King of Aragon and Valencia and Count of Barcelona from 1291 to 1327. He was also the King of Sicily from 1285 to 1295 and the King of Majorca from 1291 to 1298. From 1297 he was nominally the King of Sardinia and Corsica, but he only acquired the island of Sardinia by conquest in 1324. His full title for the last three decades of his reign was "James, by the grace of God, king of Aragon, Valencia, Sardinia and Corsica, and count of Barcelona". The House of Barcelona was a medieval dynasty that ruled the County of Barcelona continuously from 878 and the Crown of Aragon from 1137 until 1410. They descend from the Bellonids, the descendants of Wifred the Hairy. 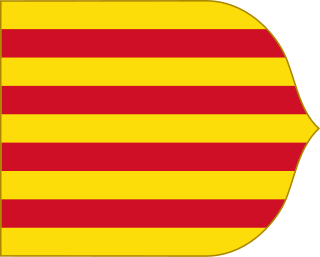 They inherited most of the Catalan counties by the thirteenth century and established a territorial Principality of Catalonia, uniting it with the Kingdom of Aragon through marriage and conquering numerous other lands and kingdoms until the death of the last legitimate male of the main branch, Martin the Humanist, in 1410. Cadet branches of the house continued to rule Urgell and Gandia. Cadet branches of the dynasty had also ruled Ausona intermittently from 878 until 1111, Provence from 1112 to 1245, and Sicily from 1282 to 1409. By the Compromise of Caspe of 1412 the Crown of Aragon passed to a branch of the House of Trastámara, descended from the infanta Eleanor of the house of Barcelona. Maria de Luna, was a queen consort of Aragon, as the spouse of King Martin I of Aragon. She was known as "La Grande", and is regarded as one of the most notable queens in Aragon. She served as Regent or "Queen-Lieutenant" of Aragon in the place of her spouse between 1396 and 1401. Martha of Armagnac was the youngest child of John I of Armagnac and his second wife Beatrice of Clermont. She was the first wife of John I of Aragon but never became Queen consort of Aragon because she was outlived by her father-in-law Peter IV of Aragon.